Please click on the photo above to see some of our collective work during that day. 1. We are now recognized and accepted by our Kabayans and other Filipino Organizations here in Qatar. 2. We were able to arouse the Filipino public's interest in photography. Proof of that is the number of people approaching our booth making inquiries and asking for application forms for membership. 3. Through the photo souvenir prints, we have recovered our expenses for putting up the booth plus a little extra. 5. We have successfully, photo-documented the event. I don't know the exact figures yet but my estimate is that collectively, we produced more than 10,000 photos. Bahala nang pumili si Rocky at si Adonis - sila na lang ang maduling :) That does not include Joel's time-lapse capture of the flag hand-print event. 6. Oh yes . . . we did managed to bag an award - kaya lang, hanggang ngayon wala pa ring makapagsabi sa akin kung anong award yung na-receive natin :) Everyone was so into shooting the event that we all got caught by surprise when the hosts called on Doha Pinoy Shooters for winning an award. I had to go in front and shake-hands with Adonis and the hosts not knowing what for - hehehe. May nakalimutan pa ba ako? Of course, maraming-maraming salamat po sa lahat - to all the members who volunteered their time, efforts, and equipments. Pati na rin yung mga hindi makasama sa event due to other prior commitments, but who actively participated in the discussion threadsa and provided some ideas and insights. Thanks to the Admin and officers who tirelessly spent many many meetings with me in Costa Coffee to organize this event. Ngayon gusto na nilang isuka ang Costa - hahaha. To those who were there, thanks a lot for staying with us until the end. 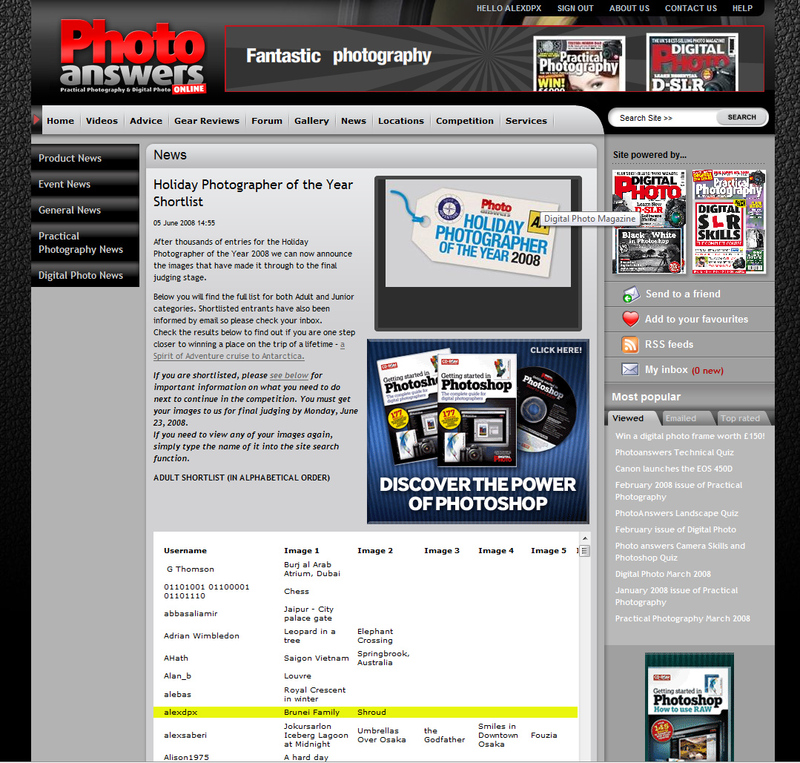 The two photos above have been shortlisted to the final judging by photoanswers.co.uk out of THOUSANDS of entries from around the world for the Holiday Photographer of the Year 2008 photo competition. Here's the screen capture from PhotoAnswer's web page . . .
And here's the link to the full size image. To continue the celebrations, GHD Doha Office has given away bamboo shoots to about 30 of its staff. Prior to today, GHD's marketing department requested for empty water bottles which will be used as vases for these bamboo shoots. This morning, I had the opportunity to photograph a table full of these bottles in varying sizes. I was shocked to learn that all the bottles came from only 3 people - collected in one work day! Just imagine how many plastic bottles could have been collected if all staff contributed the same amount. That's a lot of plastic we're simply throwing away - without thought!